The velocity dependent changes in the impedance of flowing blood have been widely reported in the literature. These changes have been suggested as a source of the impedance change of the thorax measured during Impedance Cardiography techniques. In this study, a theoretical model incorporating red blood cell orientation, was developed to predict the impedance of pulsatile blood as it flows through rigid tubes. Experimental measurements were recorded for comparisons with the theoretical model. Bovine blood was pumped through rigid tubes in a mock circulatory system and its impedance and velocity were measured. 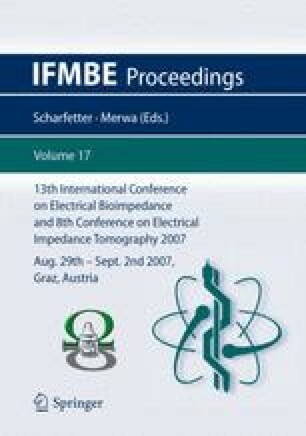 Experimental and theoretical impedance and velocity waveforms are presented for a range of cardiac parameters such as pulse rate, stroke volume and systolic/ diastolic ratio. Comparisons show that the theoretical model successfully simulated features of the experimental waveforms. These were: 1) a difference between impedance during accelerating and decelerating flow at the same velocity, 2) an instantaneous impedance response to acceleration, and 3) a decay in impedance during deceleration to zero flow. Both the modelled and experimental impedance data also indicate a good cross correlation with the velocity (r=0.73 and 0.65 respectively at a pulse rate of 70 beats per minute).